Avocado has many benefits for the skin, whether you eat it or use it topically. The oil contains pretty much the same benefits as the fruit, such as healthy fats (like omega 3), phytonutrients and vitamins A, D and E.
It’s also rich in minerals (specially potassium), which helps it penetrate the skin evenly, quickly and deeper than other plant oils, making the skin smooth and moisturized. 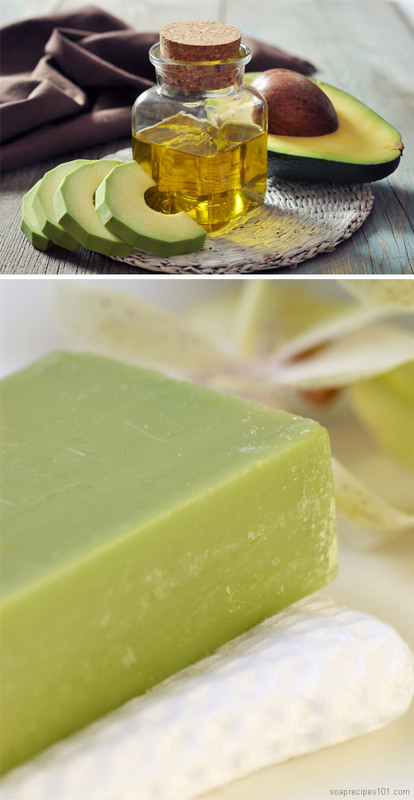 Using avocado oil for soap making will increase the conditioning properties of your finished product and add creaminess to the soap’s lather. 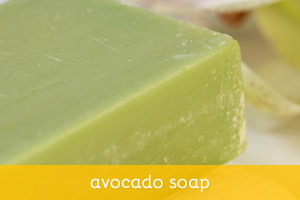 In this recipe, the combination of avocado oil with avocado puree makes a luscious, silky bar of soap. The high avocado oil content make for a very gentle bar that is great for sensitive skin, while the avocado puree contributes to a very lotion like, creamy lather. Rosemary Oleoresin Extract (ROE) is a natural antioxidant extract ingredient that will effectively extend the shelf life of your oils and combat oxidation in your homemade soaps. You need only a tiny amount — between .02% and .05% PPO. So for 1000 grams of oil (a little over 2 lbs.) you’d use between .2 and .5 grams of ROE. UPDATE: someone asked me about ROE on Facebook, so I thought I might share my answer here as well, for everyone who is interested in making this recipe. ROE is actually an antioxidant. It helps extend shelf life of soaps by slowing down the oxidation of the oils, which is the main cause of rancidity. But it won’t inhibit the growth of mould, bacteria, yeast, fungus etc. For that, you can try adding Tea Tree oil, as not only it’s antibacterial, anti-fungal etc, it’s also wonderful for the skin. 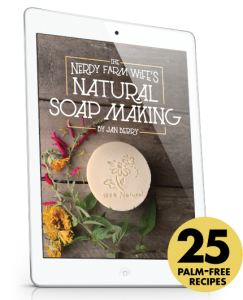 Just keep in mind that any soaps with organic matter in them will have shorter shelf life. 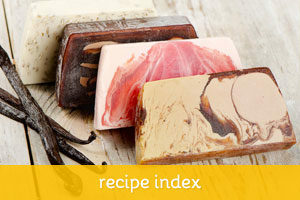 It helps to make smaller batches and store the soaps in a cool, dark, and dry place. Avocado Puree: using avocado puree tends to greatly reduce the amount of bubbles you get in your lather. To avoid that, reduce superfat to 3%. That will help you get luxurious, creamy lather and still keep some of the bubbles. The important thing here is to make sure to get your avocado flesh very smooth. Use your stickblender to the flesh in a little bowl and process until all the bumps are gone and it’s 100% smooth. Add the avocado puree to the oils at light trace and mix some more until fully incorporated. Since the vast majority of your puree is water, you can substitute half the water amount with puree. Carefully add the lye to the water (we’re only using half the amount of water as the other half will be added in the form of avocado puree later on). Set aside to cool. Heat the oils in a pan until melted, add the avocado puree, ROE and mix well. When both the lye water solution and oils are around 125-135 degrees, slowly pour the lye water into your oils stirring at all times. 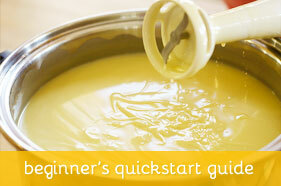 Use a stick-blender in spurts to mix thoroughly. When the soap reaches light trace, add the essential oil (if using) and blend until incorporated. Pour into mold and let it set for 24 to 48 hours. Once the soap has hardened enough, unmold, cut and let cure in a well ventilated area (preferably a cookie rack) for 4 weeks. The color of the finished soap can vary a lot. I’ve seen photos from an avocado soap that was off-white, while another batch (using the exact same recipe) was pale green. The only difference was the former used regular avocado oil, while the latter used organic. 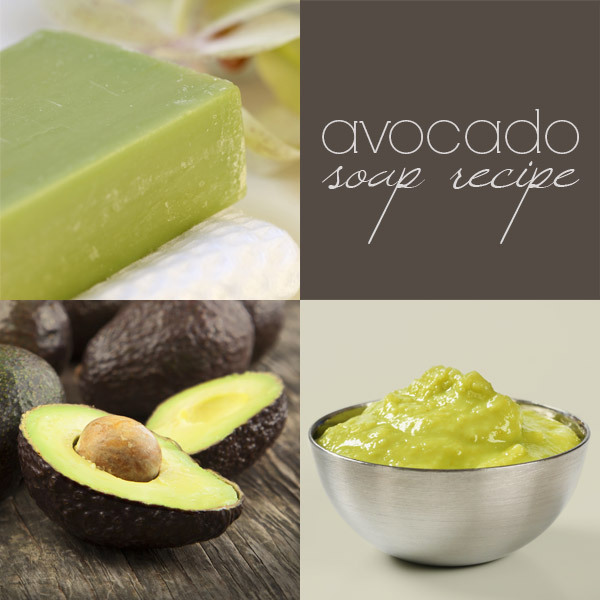 Some soapers report that using avocado puree can make your soap turn a tan/brownish color, while others say they’ve never experienced that. My guess it also depends on whether the soap goes through gel stage or not, or maybe even if the puree was added before the lye or at light trace. I really don’t mind the color of my soaps, but if you want to ensure your soap won’t brown you can put it in the freezer after pouring it into the mold. This will prevent the soap from going through gel phase by keeping the batch cool. You can also add a small amount of Green Chrome Oxide to color your soap a nice shade of green.